With the new trend of combination baskets, we offer many different sizes and variations of combination baskets for sun and shade. Besides hanging baskets off a house or shepherd hook, baskets could also be hung from a tree or deck using tree or deck hooks which we carry. If baskets are placed in the proper location, watered and fed as needed, they will bloom continuously until a heavy frost. Some plants in the basket may need to be dead headed but that would vary with the variety. Our trained staff can help you pick out baskets for sun or shade to beautify your landscape and answer any questions you may have. Our hanging baskets make a great gift for Mother's Day! We also offer pouches planted with impatiens, wax begonias, or petunias that can be hung on an outside wall and are very effective when placed next to a front or back door. They could also be hung on a fence or any other flat surface. We carry basic 10” and 12” potted combinations and single variety hanging baskets. We also carry 12” 2 gal. round fiber and 12” 3 gal. square fiber Combination Baskets. Container gardening is the hottest trend and probably the most fun! You can utilize your pots at home for vegetable, herb or flower gardens. Vegetable plants no longer need to be put in a separate garden. A container with a tomato plant supported by a circular obelisk with herbs around it can be very attractive and placed anywhere in your sunny landscape. Leaf lettuce planted in a rectangle planter hanging off your deck rail can be decorative and handy for daily picking. A planted pot of basil or chives set on your deck will be much more convenient to clip and use in your salad or baked potato. Keep your herbs handy to clip and season your favorite foods. With all the Proven Winners ® annuals and accent plants we have available, it is amazing how much fun you can have putting together different plants. If needed, our designers are also available to help you create a design for your planters at home. 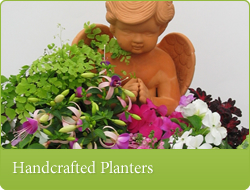 To make life a little easier, we also have beautifully designed planters on hand ranging in sizes and types. Our designers can also create a custom planter for you in your container or ours. Our planters also make great gifts for Mothers Day.